A month ago I asked my readers to send in their requests for post subjects. Lisa sent in the following request, a subject which I have covered many times before but is always worth revisiting. it ends when you are ready, when you reach the level of simplicity that works for you. I can assure you that the goal posts will just keep moving as you realise more and more, through this experience, that you need a whole lot less than you ever thought you would. Trust me I speak from experience here. I wasn’t sure I would have enough stuff to declutter to keep me going for the first 365 days 0f my pledge to remove one thing a day. Boy was I wrong, two years and three months later I am still decluttering. And it isn’t because a whole lot of new stuff has taken its place, because it hasn’t, it is just that I don’t need the stuff and the more I declutter the more aware I become of that fact. My cupboards are emptier and maintenance is easier and I am loving it and I’m not done yet. So keep at it, you will know when you are done. It is well worth the journey. Having said that, I have more to add. Only occasionally do I wonder, when will I be done with this decluttering task. As this thought crosses my mind another quickly comes in to take its place and that thought is this ~ How incredible is it that I keep discovering that I can live with even less. I don’t care how long it takes to reach the end of my journey, I don’t even know where that is. What I do know is the I am a changed person for having started down this path. Before I began I loved getting new things and I enjoyed shopping. Like most people the novelty soon worn off the old stuff and I was left with the desire to replace it with something new and exciting. Now I am free of that need and happy to be so. The cupboards were full of things I didn’t need. I thought I wanted them but now I know better. I spent more time cleaning than I needed to because there was more things to dust and more items to move in order to mop and vacuum. There were also those periodic cleaning tasks required due to the hard to get at places packed with stuff we didn’t need. I wasted money on things I didn’t really need. I wasted space on things I didn’t use. I was harsh on the environment by adding to the supply and demand of products that were unnecessary. Decluttering used to be about removing the stuff I didn’t use or that the kids had grown out of or that we just didn’t like anymore only to eventually be replace with more stuff we soon stopped using, fitting or liking. Now it is about actually reducing permanently, having more environmentally sustainable habits and the freedom of the desire for stuff. I am liberated. Join me on my journey, you won’t be sorry you did. Now that I don’t work and rarely dress up I don’t see any point in keeping so many of the jewellery pieces I made myself. Perhaps you have jewellery that could be decluttered today or maybe some other fashion accessory that not longer suits you or your current lifestyle. Now I know you are probably all thinking ~ Hasn’t this women told us to declutter jewellery about a dozen times already and now she comes out with this stash. What the… I know, I know! But jewellery doesn’t take up much space and I had bigger fish to fry OK! 😉 😆 I have to admit this is only about 1/3 of my stash. I have long ago decluttered the precious jewellery pieces that I never wear and the box I kept it in but I was in no hurry with this lot. I am sure I will declutter more of it before I am done but all in good time. Just remember “one thing a day”. I had a lovely day at the thrift store today, see all my friends there that I haven’t seen for three weeks. I tagged and prices all that jewellery from photo above and several pieces had sold before the day was out. Ahh, the joy of letting go. « Cindy’s Weekly Wisdom – Why 365 Less Things? This is another great post. I don’t think very many of us went into decluttering with the idea that it was going to be more than just getting rid of the excess. But, if you are like me (& Colleen) you have found that it does more than that. It changes who you are in many ways. I find myself looking at every purchase, every decision, every hobby, everything with a totally new perspective. I am becoming much more intentional about everything I do and am really simplifying my life in every aspect. It feels good. Like Colleen says it is liberating. I don’t think it will ever end because I don’t want to become stagnant and dusty and stodgy and I don’t want my home to become that either. I join the choir. the resolution to declutter my possessions changed my life. not just for space. but I am suddenly keeping things clean, because I really like to have it clean and its really not more than 30 minutes every other week, if you dont have stuff flying around, (and smart ladies giving you cleaning advice). I found I got super relaxed. my new motto is: if I dont do it today, I do it tomorrow, but I will do it eventually. I stop focusing on pressure and “time left” and just give myself permission to take small steps and see the progress everyday. I like the idea of getting down to nothing and then traveling. That sparks some good thoughts for me. I may just have that aim myself at some point. I do know that when the time comes that Mom passes, I will be quickly offloading all that is left here of hers and moving somewhere small. It is good to be flexible in your ideas for the future Lena because heaven knows life has a way of changing your mind for you in an instant. Make it up as you go along and things will work out just fine I am sure. The middle is at MY house. Lots of room for everyone. We may live in the middle of nowhere but chocolate and ice cream aren’t too far away. On two occasions I spent the better part of a year travelling the world with a backpack. Everything I owned fit into two small trunks and a couple of boxes that were stored in my parents’ basement. When I look back on it, a goodly amount of THAT wasn’t even necessary. I have always been an environmentalist and not a recreational shopper so BUYING has never been my nemesis but KEEPING has. I had thought that retiring and moving to the country would free my creative energy but I found that the oppression of STUFF was a major block. I’m working on reducing the stuff inside my house so I can enjoy all the beauty outside my house. I like the way you describe it. I am the same. I dont go shopping much, but I also kept whatever I had. Thank god I am over that. Really really over that. 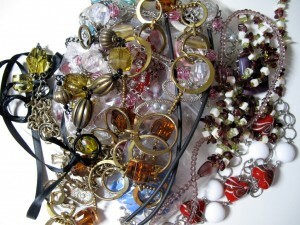 Thinking about your jewellery declutter…. Every year the children’s school fundraises by sending an envelope for parents to fill with broken, mismatched or just unwanted jewellery that they can then sell for funds. So I put aside anything in those categories in one place so that each of my 3 gets to take in their envelope in turn. But then, about 2 months ago, we were burgled 🙁 Because we actually don’t own much expensive stuff, the biggest thing they took was all my jewellery. Simply emptied a drawer, lifted 2 boxes from their places on my dressing table and grabbed 99% of all the necklaces that I hang on one of those lady’s body type holders with the multiple arms. Fortunately it was all mostly costume – my really important pieces are few and those I wear every day. I know there will be people wondering why it wasn’t better hidden but, as the police said, one cannot live expecting to be burgled and hide away stuff that you wear regularly – the advice here (in the UK) is to keep expensive jewellery off the premises or somewhere where it will take more than 20 minutes to find. Burglars like to do a whole house in 20 minutes or less if they can as it lessens the chance of getting caught. The point to telling you all this is that I’ve realised how little I wore most of it. It was a collection of 20+ years and I am sad to lose some pieces – the first pair of earrings my DH ever bought me; a pair shaped like violins (I’m a violinist) that took me 8 years of searching to find in the first place; about a dozen pairs that were the ones I wore most and kept in a travel case so that I could just grab them anytime I was going away overnight or more. But apart from that, earrings I’ve not worn in a decade, bracelets that were never my first pick because I’d long decluttered the clothes they used to match. Neatly inside boxes and so I never really viewed them as clutter. But they were really. And so, in a way, the burglary has freed me from them. I will never again own that much jewellery because I am so much pickier these days about what I buy and what I like. New pieces will have to pass much more rigorous tests to get into my house! Sorry about the burglary but I like the idea of the silver lining. Hi LJayne, the same thing happened to me. Before I started my decluttering journey I had just inherited quite a lot of good jewellery from my mother plus alll my own stuff I had acquired since I was young. Anyway the lot was taken. I was so devastated I bought very little to replace the items. After many years I took on the hobby of jewellery making and made dozens of items. I have stopped now and have given away a lot. I am obviously keeping my favourites but happily weed through every so often and there are always some pieces I can give away. Very liberating. there is nothing like looking on the bright side of an unfortunate situation. Good for you. You have also made me think about my jewellery and how much more I can happily declutter. I have a small box of pieces that mean the most to me which I hide in an odd place that I hope burglars wouldn’t think to look, the rest they can have. Here’s hope I am right about my hiding place. Perhaps you could tell us what areas they went through in their search of your home and which ones they didn’t even touch. That would give us an idea of where best to keep the important stuff. ouch. what a terrible feeling that must be, if you are so close to a robber. I lost my favourite silver earrings when we were camping on a festival and my bagpack got stolen with all my clothes and cosmetics… and it was the first of 4 days… and while I cant remember any of the clothes I lost, I really miss those earrings. LJayne, I’m sorry that you were burgled but you have managed to come past the upset of losing things you valued in such an inspiring way. I’m not much of a one for jewellery; my inventory at last count was 3 costume necklaces and an emergency wedding ring (useful when travelling as a single woman 😉 ). I would feel a burglar raiding my tiny flat would feel a wee bit hard-done-by. Colleen, I really get what you mean about letting stuff go and finding that there is no desire to replace it. I feel that I’m the odd one out because I don’t want to keep getting stuff. It doesn’t float my boat and I find it baffling. I’m no Spartan but when I’ve finished with a novel, I’m happy to take it back to the library, return it to the friend who borrowed it or add it to the thrift donation bag. I find myself looking at overstuffed homes and genuinely wondering what people want all that stuff for. I find it easy and comfortable to regard stuff in my life as “just passing thru” on its way to someone else. I’ll treat it respectfully, use it as I need it and aim to rehome it when I don’t need/ want it anymore. It’s a very different mindset to the grabbit and hoardit mentality of excessive consumerism. I think once you’ve changed your mindset, the decluttering is just logistics. Oh I do love your take on that “Just Passing Through” is so true isn’t it. I want to enjoy life and leave only footprints! I have definitely picked up the habit from here of really thinking hard about prospective new purchases. I have been wanting a new handbag (what some of you may call a purse) to replace 3 or 4 I have decluttered. I wanted something more attractive than a small rucksack, but I needed to be able to sling it across my body – I can’t bear having to hold a bag in my hand, it makes me feel confined. Anyway I have been looking, researching and waiting to find the right one and now I have, called a ‘healthy back bag’. It’s ergonomically designed to be good for backs/necks/shoulders, and comes in all sorts of materials and colours and has lots of pockets on the inside and is designed with security in mind. I totally love it, and it makes me travel light with it too by thinking twice what I want in each pocket, and it so light and comfy, practical yet attractive. Since finding it, I have resisted buying several other bags I fancy because I know I just don’t need anything more, and they don’t really suit my needs. So I now own, one eggplant colour ‘healthyback bag‘ one suede ‘proper’ smart handbag, one backpack with pull out handle and wheels for picking up top up food shopping between major food shops and one without wheels that may end up going if I don’t use it this summer. That’s my total day to day bag count. I do also own a large shopping trolley which I love. All other bags have been passed to charity shops. I am glad you have found just the right product for you. It pays to wait, search out just the right thing and not settle for second best. On the jewelry issue, I gathered all my OLD 9ct gold things and had them melted down to make a bangle. The small diamonds were placed randomly all around it. It’s amazing how much gold was there. This was to celebrate our 30th wedding anniversary. So, whilst the items loved ones had given me were kind of still there, it was just in a different form e.g. the bangle. This was not my original idea of course…I pinched it from a friend. She’s ok with it. I’m a simple jewellery wearer in that I just like wearing the basic stuff (I don’t have a ring on every finger) and I don’t wear costume jewellery. I do like my gold though !!! wow. those bagpacks look fantastic. well done researching your needs. You just made me remember that I need to get a basket for my bike, because I cant put my handbag around my back. Took another load of stuff to the charity shop this morning and picked up a check from the antique shop where two of my consignment items sold. I’ve all but given up shopping, so nothing new is coming in, and yet I can still declutter an item a day. By the way, on the drive home from the charity shop, I felt much lighter than on the way there — freedom from too much stuff feels good. Wow, good for you Anita. There is nothing like putting your home on a diet is there. And when you get cash in your purse as a result that is a double bonus. LJayne – I am sorry about the break in on your house. Two years ago, the houses on either side of us and behind us were all broken into except us one Saturday. Obviously our stuff wasn’t good enough for them 🙂 or (as it was pre-decluttering days) else they looked in the window and assumed someone had already broken in and trashed the place. 🙂 Actually the police who came around the neighbour hood felt it was because we were the only one at the time who didn’t have a flat screen tv, so my older daughter who’d been on a campaign for sometime for a flat screen, put up a notice in the window “Dear Robbers, please take our manky old TV so we can claim insurance”. It didn’t work. Though later that year (Dec) I convinced my husband if we were going to book something up on hire purchase then was the time to do it because our younger daughter was scheduled for braces for October following, and we would only have a small cross over period with the two installment plans. So we got his tv and home theatre system. Of course, Murphy’s Law rose up (do you have Murphy’s Law elsewhere? where anything that can go wrong will go wrong – its what we call it here, don’t actually know who Murphy is though) the Orthodontist saw my daughter in Feb and said they needed to go on right away due to blah-blah-blah, in March the dryer died so another hire purchase, in April the washing machine broke down and was so old it was uneconomical to repair, so another hire purchase, in May the car needed some parts replacing. Took a while to get on top of things again. Hi Dizzy – I should have ‘touched wood’ aye! Some of these expression really could have double entendres if your mind was so inclined. What I really like about getting further along on the decluttering journey, combined with bringing less into the home, is that our homes then keep getting better and better. The unwanted, unloved stuff is gone (or in the process of going), and only carefully selected items are coming in, so it is a continual process of improving. This allows us to really enjoy what what we have, and know that it is current to our lifestyle today, not ten or twenty years ago. Truthfully, I don’t know that we ever get to the point that we are done de-cluttering because stuff always is coming in. Sometimes we have to learn by experience that we won’t use something as much as we thought we would. De-cluttering better is about learning to question your possession of things that you previously thought were not to be questioned. I prefer to think I will get to a point where I am only maintenance decluttering where worn out things are replaced or as things wear out I choose not to replace them. I look at this as a different level to deliberate minimising decluttering. If that makes sense. I question everything that stays and doubly question anything that we consider buying these days. I’m really crying at the moment Ladies I have to confess to an ‘EPIC FAIL OF COMPRESSING THE DVD COLLECTION’ !!! I have no experience with this Dizzy as we don’t have that many DVD’s so they are still in their original boxes. We did do this with our CDs though but because everyone has iPods we don’t need to use them at all so no problem there. Hi Dizzy, try Gaylord.com. They are a library supply company and carry binders and sleeves for DVD storage. Decluttering is like laundry and dishes. They go on and on and on. On the bright side, it’s nice to be alive to do them and it’s nice to always have something to do in case you ever get bored! Hi Spendwisemom, I just flicked over to your site and wow WOW wow. I loved looking at your $50 grocery challenge. I wish we had coupon specials like you get. If I could get all that food for $50 I would be a very happy girl. I am currently spending around $100 – $150 a week ‘What the’ mind you I used to stupidly spend up around $200-$250 a week owing to the fact that I used to shop stupidly and obviously blindly!! The burglars totally went through our lounge. So all the desk – even the box where I put my paper recycling when I’m going through the post! – the bureau, the shelves, the cupboards. They flicked through books in case cash was hidden there. They stole our change pot too, as someone else said, easy pickings. They looked in our understairs cupboard but missed the switch for the light and so by the light of a small torch they found, they just had a quick look at the shelves. When we were burgled the first time (about 6 years ago) they went through every kitchen cupboard but ours this time didn’t. I’m not even sure they went in there because they could have taken my DH’s small digital radio off the counter and they didn’t. But they did rifle through a handbag – fortunately one I wasn’t using so didn’t have anything in it – that was hanging on the end of the stairs just outside the kitchen so I don’t know. They didn’t touch our playroom, but then that does, with 3 kids, look trashed already most of the time tee hee. Plus it looks right out onto the street and we don’t have nets or voile curtains in that room. They might have though they could be seen by passers by. Upstairs you get to my son’s room first. They went through all the drawers but only found clothes, stealing his two money boxes off the top. So next into the room my daughters share, they only pulled open the top drawer of one chest and didn’t bother with the other drawers or the other chest. I guess they assumed they would only find clothes but they therefore did miss a bit of jewellery. They went through my daughters’ jewellery boxes but it is all kiddy plastic stuff so they left it. Quick look through the bathroom cupboard and then into our room where they again went through every drawer, some of the books on my shelf, all through my wardrobe, quick look in my husband’s. They even went under the bed to have a rummage through the storage boxes under there but we only have spare bedding there until I get around to decluttering that and storing it better! Interestingly, when we go away for the weekend, we usually put the really important things quite well hidden in our loft, ie not just inside the hatch. So my husband’s laptop, the computer back up drive, the Wii. When the police came to take our statements they said it is a good thing to do. But then we discovered that the house the burglars went to next – they did one 5 doors up – they went through the loft there 🙁 So you would have to pick something like the bottom of a box where you maybe store old packaging – I tend to keep stuff that good toys come out of so I can resell/pass on in the packaging – and hope that finding empty box after empty box stops the burglars from going right to the bottom. Just like they thought it was no point going through drawers of clothes in my daughters’ room only having found that in my son’s. They made a lot of mess but the police reckon they would only have had 20-30 minutes tops. Sounds like there was more than one doing the burglaring. How horrible to have to go through that. I need to think through hiding places a little better. I think also Sanna that the younger you are the further away that finish line is. Oh, I’m at that “when will it ever end?” point too. I just moved, and am enjoying the emptiness of the non-essentials being packed away. Living with only 5 pairs of earings available for the past two months meant that taking my big jewelry culling* to a women’s retreat this past weekend and letting people take what they wanted was nothing but joy. However, a full time job and now yard work and home repairs on top of that means I feel like I have “no” time to go thru boxes and cull more, which is very frustrating. 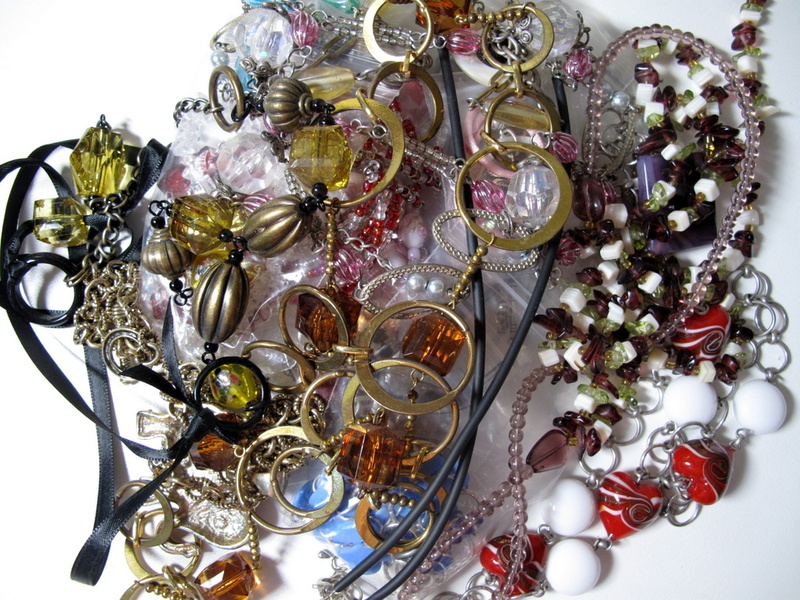 * A month or so before my move, I tried a half-cull of my jewelry (suggested in The Minimalist Packrat) – getting rid of a piece for every piece I was keeping. I don’t think I managed to be completely 50/50, but it really helped me reduce to a more managable level. This was after 3 or more less than productive culls where I just looked for things I didn’t want. It took the irritation of my unproductive attempts to try a new way. Another example of frustration ending up helping. Hi Whisper, nice to hear from you again. I can understand your frustration at the moment not being about to get to your stuff because it is in boxes. It must be nice to have a holiday from it though. When we moved to America to live years ago I deliberately left some stuff behind in storage for that very reason. It was much mostly things I was tired of caring for like the silver tea service that I didn’t like polishing and some other stuff. Needless to say they were the first things I culled when the decluttering began. I think you are the first person so wonder what you were going to fill the time with that you have freed up from no taking care of unnecessary stuff. I can actually understand this question and wondered why no one had ever asked before. The time I freed up went to running my blog so I don’t have any more free time but I get a whole lot more satisfaction out of that than I do out of dusting and cleaning clutter. When we move to a smaller home I will free up a little more time. I don’t waste time shopping anymore either, I spend that time socialising with friends. Since I also gave up my job I need that social time for interacting with people because I no longer get that at work. What you are saying about culling your jewellery by half rather than just choosing the pieces you really didn’t want makes sense to me too. I use a similar approach with many things in my home. Instead of considering what I don’t want I think about how much less I do want. The desire to minimise usually usurps the desire to keep certain things I still feel slightly attached to. Colleen, I’m writing a novel – or at least I’m trying really hard to. It has been a childhood’s dream to become a “writer” and I never really tried it, but always put it off (too little time, too little motivation, no great idea, etc etc) Now I’m really doing it and will only stop when I have a complete story of at least 160-200 pages FINISHED (I’m at 112 pages rough draft now). I think this is an important task for me, as it also takes away some mental aspirational clutter (in form of an old, but never persued, dream). When I’m done with that first novel, I’ll be able to tell whether writing is really a dream for me or whether I’ll rather go on and start finding a new dream. Hey Sanna, good for you! I live with an aspiring novel writer, and there seem to be alot of things that get in the way of that. Modern life can makes it easy to do ten thousand little things, but hard to get one big thing done. Alright Sanna!!! I look forward to seeing you on the best seller list and then I can say to my friends “She used to read my stuff once.” Dreams are funny little things aren’t they. A bit like fantasising over a childhood sweetheart. The situation could go one way or another once you get the opportunity to “test the waters” so to speak. I hope you are very successful. I really love it that I came to focus more on the big dreams of my life than worry too much about little stuff through that process of decluttering. I usually know things instantly, or I have to ponder them for awhile. And since I had no clue I wanted to fill that space-time with (once I noticed that I had it), nor did something naturally fill it, it felt better to contemplate it for awhile. I wanted to make sure I was using this “opening up” on something I wanted, and not something I felt I should be doing. That another kind of clutter I’m trying to get out of my life. It is so freeing to get rid of unneeded stuff, but it can be paradoxical. As I get more practiced identifying things not to keep and get them out the door, I realize how much of what previously was worth keeping isn’t any more, and what I’d gone through and “finished” now needs going thru again. I know this is a life-long process and not a destination, but I’m ready to be alot further along, LOL. from what you are saying you are already a lot further along than you thought you would be at the beginning and that is what it is all about. I like the idea of filling your newfound time space with something that isn’t what you should be doing but what you want to do. I’m another one who lost all interest in recreational shopping after I decluttered. Hate shopping now, and haven’t set foot in a mall in ten years or more. We moved into my small house when we got married, and my husband has a LOT of stuff. On top of that, he is an avid yard sale goer, and can’t say “no” when anybody offers him an item they’re getting rid of. I constantly try to get rid of out the back door the many items he brings in the front door because I can’t stand clutter. It keeps me busy, that’s for sure. I think he’s finally starting to understand what I’ve been telling him–that we’re not getting any younger and don’t want to be dealing with a bunch of “stuff” in old age, and also that we don’t want to leave a bunch of stuff when we’re gone that our children will have to try to get rid of. I am so glad your husband is finally getting it and so grateful that my husband has been on board from the start. Another reason to be grateful that I can add to the list. I am sure that those you leave behind will be grateful that you got your stuff in order so they weren’t left to deal with it. What a treasure to leave behind for those you love. I’m at a point in my decluttering where it’s not something I think about daily anymore. I might go a whole week & not actively seek out (or even unconsciously look for) stuff to declutter. But then the very next day, I awaken & realize I no longer need or want that (fill in the blank) & get rid of it. I’m in total agreement with Colleen that as you declutter, there’s an underlying shift in your attachment to things. Just because you bought it or it was given to you or it’s “just always been there” doesn’t mean you have to be a good steward to it forever. Keep the items that you find esthetically pleasing. Keep the things necessary & vital. But all the other stuff is well…just stuff. You and I are on the same page here that’s for sure Jane. The less we have the easier it is to get to the things that matter. Whether that be the useful items or freeing up time to spend on more important things like family, friends or relaxation. Who wouldn’t want that. It’s interesting that Becky and Jane have remarked on not getting any younger in the context of decluttering and just wanting less stuff around. Two nights ago, I was chatting with Mum on the phone and the subject of THE LOFT came up. Like most UK roofspaces this is an unfloored, unlit, can’t-stand-up-in-it packrat’s nightmare. There’s stuff up there which hasn’t been disturbed for many years and bag after bag of yarn. All in teetering piles balanced on joists on top of the insulation. Horrible job to tackle. I don’t relish the thought of my parents becoming infirm but I am pleased that Mum is taking the first tentative steps on the way to decluttering her overstuffed home. D’you think this simplifying business is contagious? Good for you GreyQueen, offering to help your mum. I did the same recently though I think she has things pretty much under control. I must talk to her about it again since I am planning of visiting her soon. I sure hope this simplifying business is contagious. I know my reader count continues to grow each day so lets hope a revolution has begun, both with decluttering and anti-consumerism. I had a conversation with my mother about the attic too, she said she was thinking about emptying it. we have a flat rented out in the other attic, so in order to get to our christmas stuff, we have to enter the apartment, that requires a note to the woman who lives there (you know legal stuff) and thats just too much of a hassle if you only want to quickly bring something, or get something down. So she suggested to empty it and find places for the rest in the basement… We should tackle that the next time I am there. I wouldn’t be surprised if possession is 9 10th of the law when it come to the stuff stored in the attic of an apartment rented to someone else. They could probably take possession of the items after a certain period of time. An encouraging post! I know that with two girls 3 and under and a new house and small farm to outfit I’ll be on this journey for quite a while! It’s just not possible to stem the influx of new items just yet, or even old ones that I’m sure we WON’T use. I’m best pleased to collect as we need but my dear husband is more of a grab what you can now and sort it out later kind of planner. It doesn’t help that his grandad recently parted out his estate (though he was so thoughtful to do it while he was alive and well and while done quickly, it was a rather pleaant experience for all involved!! Thanks Grandad!) and my husband had brought home any and every box that contained something I might be remotely interested including, alas our weakness, boxes of old books! It’s a tough call knowing what to keep for the babes as they grow. They were born opposite seasons so most of the baby clothes I saved weren’t approprite, and I have a whole stash of hand me down clothes for my oldest when suddenly she refuses to don anything but dresses! On the other hand, all these things, as with many others like them, cost nothing but storage space and fore thougt and proved to be well worth it! Now I’m just rambling. What I’m trying to say is I suppose there are no easy answers I suppose — it’s always a journey. Fortunately for me, at my time in life, it has become a one way journey towards a more minimalistic lifestyle. When one is younger and the children are small there can be a lot of life changes that effect what one needs and when. That isn’t to say my life is completely static but there are certainly a lot less variable than there used to be now that the children are older and leaving the nest. The only channel I can ever see myself going down is to do something with my creative side which, with the wisdom I have gained, would hopefully involve a fluid motion of stuff in stuff out. Hi Bergen! 🙂 No need to feel overwhelmed, just stick with Colleen’s slow approach: one item a day. I wouldn’t have believed I’d ever declutter the things I’m giving away these days. Like books, for example. I already gave away more than half of what I started out with. And that’s me, a book lover and avid reader. That wouldn’t have been possible in one day or even one week, it took some time to realize I rather have that empty space in my shelves and the best books right at hand than owning a library of my own. There are libraries and book stores right around the corner and both are so fast in ordering books from elsewhere these days, that there is really no need for me to host a private library. It’s not as if I was a landlord of the 17th century who has to make sure to care for the education of his subjects or anything. if you feel overwhelmed, grab the next easy to spot item and get rid of it, and pat yourself on the shoulder. and just keep doing it, with one item a day. I just dropped in to get rid of the metaphor that had formed in my head since I read about the finish line … that you only absolutely need a specific destination if you don’t enjoy the walk, but if you like the walking itself you sometimes go different paths than you thought you would, you might walk longer and you might discover places you didn’t know about – all while it doesn’t feel like a chore but like an adventure. And as I saw Lena’s and Sanna’s comments I thought: Let’s be a little German cheer group for you. You’ll get there! Where? You don’t have to know now (and don’t have to waste all your energy to find out). You’ll get there anyway. This blog is a nice place for not “walking” alone. however, you will see in a couple of months what you will really need and what not. and yeah, the bigger the space the more the clutter. big house brings a lot of stuff with it. But then you have a garden and animals, I so envy you for turkeys, chickens and bees. seems like your kids will grow up in close to nature surrounding… that I really like very much. and I think its the most sustainable way to live. just work on the stuff you are comfortable getting rid of and don’t worry about the rest. The beauty of the slow approach is that you train yourself along the way as to what really is necessary and what isn’t. There is no way that I had any idea where this journey would lead me and I still don’t know where the end might be. I sure know though that I have a whole lots less stuff now than when I began and a vast amount of that would not have been considered in a quick declutter. One thing at a time and don’t even bother thinking about the rest or about an ideal that doesn’t suit your current situation. Ideealistin, I love your phrase “we are not walking alone”. I felt so comfortable when I found this website and hear that I am on the same page as most of you. I am trying to declutter my library and while I have a lot of books, once I read them, they are gone. To someone who likes reading mysteries, to the library for their sell shelf or back to whomever gave it to me. My sister belongs to a book club and sends me a box of books every 2 mo or so. Some I like and read immediately, others I give away but once they are read, they are gone. She recently purchased a “nook” and will not be buying hardbound books much anymore. YAY for me. Perhaps I can catch up on my reading and get rid of some things in my bookcase that I thought I would like but are sitting there waiting. Am very interested in anyone else’s ideas on sorting their library stash. I’m at it at the moment, too. I just sorted through my library again. Now 2 shelves of novels belong to my boyfriend, 5 shelves belong to me. Of those 5 shelves, one and a half shelves are full of unread novels. I’m working my way through them. I just quit more easily, if I feel that I don’t really want to continue reading that particular book. Like, I got a book from my friend (David Nicholls “One day”) and now I’m about a third into it and it still didn’t enchant me. It’s not bad, but as soon as I pause, I don’t feel any interest in continuing, so I think, I might just quit right here and go on with the next book. I also started listing books from my stash for sale and leave it up to fate whether I first come round reading or selling them. I finally got a Kindle (a gift) and that is helping me to let go of things. I still have one shelf of the books by my three favorite authors that I won’t let go of. When I can finally afford to get them all for my Kindle I might but until then they are on that shelf and will stay there. We have another shelf full of books my Mom wants to hang on to because they are easy reads and when she runs out of something she can revert to them. I wish I could afford a Kindle for Mom. That way she could always have books to read and we could get rid of all of the books. Minimal – not a chance. I have a 5 shelf bookcase downstairs filled with books. Paperbacks are double shelved. A bookcase in our guest bedroom with cookbooks and paper recipes that I am decluttering daily. Also, in my bedroom, 4 bookcases – 3 which have 3 shelves each and one tall one with 5 shelves. Minimizing is a VERY SLOW process. Plus I have bags of books. One bookshelf upstairs is filled with quilt books but the rest need to be sorted desperately. One book at a time. But, one important thing I am doing is that if I start reading and it doesn’t just grab me within the first 2 or 3 chapters – I just pass it along. I just don’t have time to read what doesn’t interest me. I used to struggle through books just because I thought that if I started reading it I should finish it but no longer. Not everything is worth the time. Try that, you might like doing that. Then think of that book as your declutter item of the day. Sanna, good to know someone else has book issues. huh, interesting. if I havent finished a book I cant give it away. its like unfinished business… I often had several attempts to read a book, because I was either not mature enough to get it (german classic literature), or because it made me sick (eating animals – jonathan safran joer) or because I didnt have the energy to get through the first crap. There are a lot of books that I loved that were like that. Middlesex for example or lord of the rings, etc. So I have now 4 books waiting in my shelf to get a second chance. and only if I am finished with those, I can think about getting rid of them. wait. come to think of it, there are books that I dont finish. recently my cousin gave me a book called “shopaholic” or so. holy cow, I mean I asked for “something light and funny” but I never read anything lighter than that, and I didnt think it was funny at all… even childrens books have more sense and meaning to them. That was a book I didnt finish, I stopped after 20 pages and read one page in the middle and at the end. it was the same everywhere. Wont waste my time on bs. Haha, I loved the “Shopaholic” books. I read either really light stuff (you might call it trash, I don’t mind) or thought provoking, difficult literature. Can’t stand anything in between though. Books like those Lelord’s “Hector” series etc just annoy me. lol. REALLY?? ok, I give you that: if you would have given me those books 8 years ago, I probably would have been happily entertained, but I cant stand this happy glittery rich world at all, and I for sure dont get the humour in it. Guess I changed quite a bit. The books I read, come mostly from 2 people whose taste in books I admire very much, they are coming up with great and usually unknown things, I never had a bad book of them. and if I need any new fodder I would always ask them first. and then bestsellers. You might want to try this trick, if you have alot of unfinished books. I had a “to-read” shelf that was half full of books I felt I should read or needed to finish. I wrote down all the titles and authors, and gave myself permision to get rid of the books, because now I could find them once I was “ready” to read them. It felt really good. Even better, a couple months after that, I found the list, and felt no need to keep it either, though your mileage may vary. thanks for that tip, but maybe I wasnt clear. I am not bothered by those unfinished books. I dont feel the pressure to read them now. They stay in that shelf and look at me and I know one day (probably next year, because I am in the middle of graduation) I will get there and try to find my way in or give them another chance from the beginning… I am actually looking forward to the time where I am not “forced to read and learn” but do it, because I want to read a book for entertainment. and I will get around to finally tackle the classics again, that are waiting there for me in my shelf. maybe something happenend in the meantime and I am then “ready for them”. Maybe not. We will see. we have had many a reader here at 365 with book issues but they have all come a long way since they first started commenting. Ann as one of them, her first comment was very similar to this one. Now that I think about it we haven’t heard from her for a while. I had better send her an email and make sure all is OK with her. Judging from this comment you have already made progress in your attitude to the books. So well done you. Love this idea, especially for the books that are borderline – might want to read, might not or for the ones that have been hanging around for a long time that get pushed aside for “something better”.